Linetec revealed its new message, “Single Source Solution” for architectural finishing, along with a brand new website and printed literature. “Customers rely on Linetec as a single source solution for their architectural aluminum needs according to the research insights gained in creating our new website. Building on this reputation and recognition, we are incorporating the Single Source Solution message into all of our marketing materials,” explained Linetec’s marketing manager, Tammy Schroeder. “As the largest finishing company of architectural aluminum products in the U.S., Linetec’s ability to provide core finishing needs of both paint and anodize, along with a wide range of specialty finishes, and many other services both upstream and downstream of the finishing process, help our customers save time and money,” said Linetec’ Rick Marshall, Linetec’s president. The new website, Linetec.com, provides a comprehensive overview of the company’s paint, anodize and specialty finishes, as well as specifications, processes, quality and environmental considerations, maintenance guidelines, warranty information, and color charts. The online “Select and Spec” tool, and request forms for samples and quotes, are available on demand. Frequently Asked Questions (FAQs) and answers are detailed throughout the site. 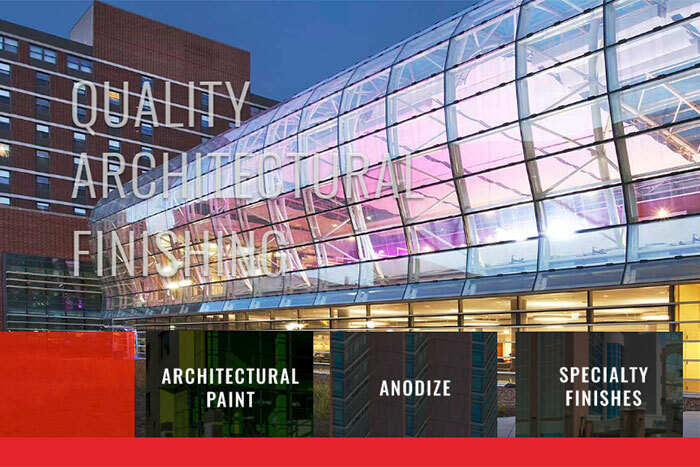 The “Paint” section highlights Linetec’s unlimited choice of colors in all architectural finish types: 70 percent fluoropolymer, 50 percent fluoropolymer and baked enamel paints. The “Anodize” section emphasizes the extreme durability and longevity of these metal finishes. “Specialty Finishes” showcases such custom options as Brushed Stainless Anodize, Copper Anodize, Wood Grain finishes and textured Terra Cotta coatings. The “Services” section describes Linetec’s value-added offering of customer material warehousing (Linetec Managed Inventory), thermal improvement services (both thermal strut and poured-and-debridged), aluminum stretch forming, flat sheets, brake metal and fabrication, on-site repair and restoration, and route trucking services. The “Company” section shares Linetec’s history, mission, values and contacts. This section also connects visitors to regular news updates and blog posts. New Linetec websiteVisitors can explore further with links to Linetec’s “Careers” section and job postings, its “Customer Portal” to password-protected customer specific information, its multiple social media options, and its “Architectural Resource Center” with access to three-part guide specifications, helpful forms and new literature. Reflecting the same design and “Single Source Solution” message as its website, Linetec’s new collage of literature also is available for download. To request a printed copy or for additional information on Linetec, please call 888-717-1472 or email sales@linetec.com.